“Our enemy wanted to kill our civilization, but we have won through our unity and our determination. We have triumphed in little time,” Abadi said. Abadi’s declaration came after Lt. Gen. Abdul Amir Yarallah, commander of the Iraq army’s Upper Euphrates and Jazirah Combing Operations, announced the liberation of all Iraqi lands from ISIS. In a statement, Yarallah said troops of the Iraqi army and al-Hashd al-Shaabi (Popular Mobilization Forces), backed by fighter jets, managed to liberate the desert between Nineveh and Anbar. Iraqi troops on Dec. 8 purged 35 villages and an area of 4,300 square kilometers in the Jazirah and Upper Euphrates regions, according to Yarallah. 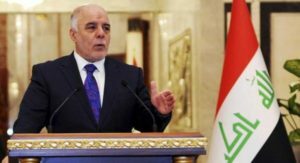 Last month, Abadi said Iraq had defeated ISIS on a military level, but he said final victory would not be declared until the desert areas were purged of ISIS. Some ISIS fighters are reported to have dispersed from Iraq into the Syrian countryside, while others are believed to have escaped across the Turkish border.